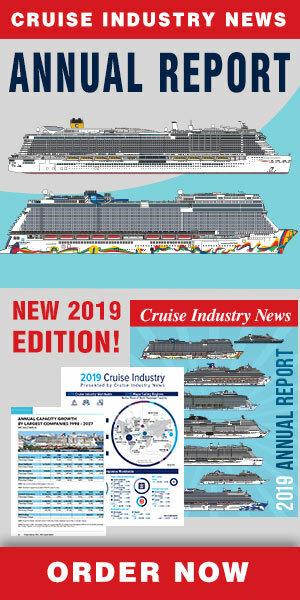 This year will see an upswing of cruise capacity deployed in the Caribbean, the Mediterranean, Alaska, the West Coast, South America, the Indian Ocean/Red Sea and the Persian Gulf, Bermuda, Hawaii, Africa and the Panama Canal, according to the 2019 Cruise Industry News Annual Report. The Caribbean is likely to see more than 10.7 million cruise passengers compared to 10.2 million last year, commanding a global market share of 38.7 percent. Thus, this will be a record year for the Caribbean in terms of passenger numbers, although its percentage share of the worldwide cruise capacity will be below the 42.2 percent estimated for 2014. The Mediterranean will also see it strongest year ever in terms of passenger numbers at 4.1 million and 14.8 percent of the global capacity, but its market share is also down from 17.9 percent in 2015 when 9.6 million sailed. Alaska is also expected to have a record year with more than 1.2 million passengers and a 4.4 percent market share. The previous records year was 2008 with just over one million passengers. The West Coast is also seeing a bump up to nearly one million passengers from 870,000 last year. Bermuda will see a 30 percent increase and Antarctica 40 percent. While the Indian Ocean will see a significant increase that is mainly driven by the Indian start-up Jalesh Cruises. Northern and western Europe stays relatively flat with 2.6 million passengers this year and 2.5 million last year, and a 9.4 percent market share year-over-year. Asia/Pacific will see a significant drop, mainly due to the readjustment of capacity in China; Australia stays flat, as do the Canary Islands and South America.